I tell ne w leaders this story all the time. When I was a young Project Manager for a Fortune 500 Company I was given a very important Project that had visibility all the way up to the CEO of the company. I was so excited. This was my big chance to show what a skilled Project Manager I was. I spent weeks assembling the best and brightest minds in the company. Three months into the Project we were on time, on budget, and meeting every key deliverable. One day my boss asked me to report on how we were doing on the Project at the next senior leadership meeting. I couldn’t wait. I was so proud of our progress. I put together a beautiful presentation and reviewed our timelines, budget, and key accomplishments to date. What? First he heard of this? What was he talking about? I quickly realized that I had not been keeping him informed of our progress, and he clearly had been promising a much quicker timeline than what I was reporting. Needless to say, my boss spent the rest of the afternoon badgering me about why he hadn’t been advised sooner. I left that day wondering if I should ever come back, or if they even wanted me back. The next morning, I decided to review the Project plan with my boss in detail. That’s when he gave me some of the best advice I have ever received. The key lesson is that you can have the right team. You can have a great plan. You can be moving faster than any other team, but if the key stakeholders are expecting something else, then you are in trouble. I have never forgot that lesson. As a leader, you must manage expectations or be damn good at managing emotions. 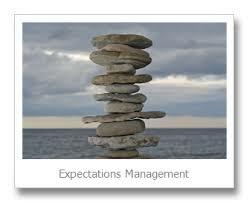 I have learned over the years that managing expectations will get you much further and you will build credibility as someone who is able to deliver on what they promised. Off to a great start, Mark! Looking forward to more of your thoughts. Thanks Bret. I am glad you enjoyed it, and looking forward to posting more as well. Thanks for your help! That is a valuable lesson indeed! Thanks for sharing so that we can learn from your experience. Thanks Randy, appreciate the comment.